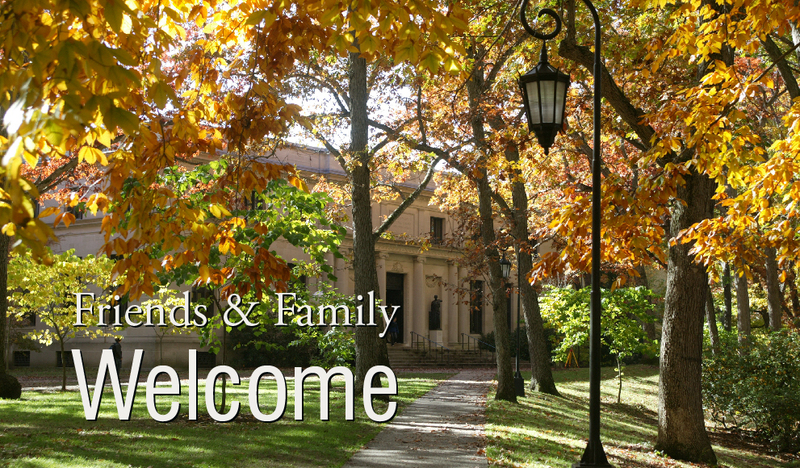 Wellesley extends a warm welcome to everyone attending this year's Family & Friends Weekend and Homecoming, which kicks off Friday, September 25, and runs through September 27. More than 600 visitors are expected to participate in this celebration of all things Wellesley. Friday morning the festivities begin with attendees visiting various classrooms, followed by campus tours, a performance by the Guild of Carillonneurs in the Galen Stone Tower, a wine and cheese reception in the Davis Museum, and much, much more. "We have so many activities this year that I feel like cruise director Julie McCoy [on the TV show The Love Boat]," said Laura St. Germain Adamczyk '87, director of parent and family programs. "We want family members, friends, and alumnae to experience—or remember—how rich the Wellesley experience is." Among the new attractions are an open house at the Book Arts Lab, Special Collections, and Conservation Facility; a faculty-led discussion of David McCullough's book The Greater Journey: Americans in Paris; a sustainability walking tour highlighting initiatives, accomplishments, and plans across campus; a global tea at the Slater International Center; and the dedication of the Butler Boathouse. The weekend will also include a Wellesley-themed Jeopardy! tournament featuring Julia Collins '05, who recently became the show’s winningest woman and holds the second-longest winning streak of all time, with 21 games. Collins will compete against faculty and staff members Ann Velenchik, Sally Sommers Smith (who participated on the show in 2012), and Melissa Saporetti, as well as Kelly Alexander '16 and Kelsey Trabucco '16, and Gwen Clancy '73 P'16. Claire Verbeck '16, a member of Upstage, will serve as host. Throughout the weekend, alumnae will renew their Wellesley ties and create new memories, whether through playing alumnae squash or softball, or reconnecting with a favorite professor after hearing a faculty lecture. The Class of '83 will plant a tree as part of its mini-reunion. Other alumnae will pose for the Legacy photo for Wellesley magazine. Prospective students can experience the Wellesley difference through Discover Wellesley, a morning program that includes student-led campus tours, panel discussions about what makes the College extraordinary, and information sessions with admission and financial aid counselors. The weekend will also include a variety of spiritual services, athletic events, film screenings, opportunities to view and discuss art, and the chance to make your own s'mores, the favorite snack of Wellesley students. "There really is an activity to please everyone," said St. Germain Adamczyk. A full schedule for the weekend is available via Guidebook.